Although "vegetable soup" seems to imply a dish that has no meat-based ingredients, that isn't always the case, and totally vegetarian vegetable soup can actually be quite hard to find. Even soups with no pieces of meat in them are often made with meat-based broths or bouillon, which can complicate things for vegetarians and vegans. Unless you go to an entirely vegetarian restaurant, it's never safe to assume a veggie variety of soup has no meat ingredients unless you confirm that with the server or cook. Soups made with vegetable broth or vegetable bouillon bases are rare. Some chefs don't use them because they feel those ingredients don't provide as strong or rich a flavor as meat-based items. For those reasons, plenty of people who follow a plant-based diet need to rely on homemade batches of soup to ensure all ingredients are suitable for them. Starting with a solid vegetable broth recipe is a great way to create a foundation for most soups. The below recipe makes about two quarts of broth. Soup is one of the easiest meals to freeze and reheat. Lightly coat the onions, carrots, potatoes, mushrooms, tomato, and turnip or squash with half the olive oil. Roast the vegetables until they are brown and have begun to caramelize, about 45 to 60 minutes. Stir the veggies every 10 to 15 minutes. 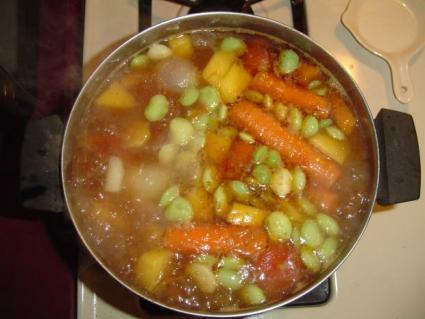 Fill a large stock pot with the celery, browned vegetables, and remaining ingredients. Bring the mixture to a boil, then reduce the heat and continue to simmer until the stock has reduced by half. Let the stock cool, and pour it through a colander to catch the vegetable pieces, peelings, and large seasonings. The strained, cooked vegetables are suitable to eat or use in another recipe. Use the broth right away, refrigerate it for up to a week, or freeze it for up to several months. Although commercial varieties of vegetable stock are available at almost every grocery store, homemade stock has a richer taste, makes a greater quantity and is cheaper to produce. It's also much lower in sodium than commercial stocks. After preparing an entirely vegetarian stock, you can use the result to make any type of plant-based soup, stew, or curry. 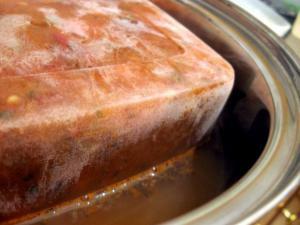 Frozen cubes of vegetable stock also work well to thin out sauces and stews that need extra flavor. Each of these recipes starts with the vegetable broth above and makes truly delicious soups. This soup is perfect for a fall or winter dinner. The recipe serves 4. In a large saucepan, heat the coconut oil over medium-high heat until it shimmers. Add the onions and cook, stirring occasionally, until they begin to brown, about six minutes. Add the ginger and cook, stirring constantly, until it is fragrant, about one minute more. Add the vegetable broth, using the side of the spoon to scrape any stuck on bits of onion from the bottom of the pan. Add the carrots and bring the soup to a simmer. Reduce the heat to medium and continue to simmer until the carrots are soft, 10 to 15 minutes. Pour the hot soup into a blender or food processor and add the coconut milk and sriracha. Protect your hand with a folded towel and place it on the top of the blender or food processor. Pulse the food processor for 10 one-second pulses, and then carefully allow the steam to escape out of the opening in the top. Blend, pausing occasionally to allow the steam to escape, until the soup is pureed. This hearty soup is filled with delicious vegetables, beans, and pasta. It serves six. In a large pot over medium-high heat, heat the oil until it shimmers. Add the onion and cook, stirring occasionally, until it softens and begins to brown, about six minutes. Stir in the vegetable broth, scraping any browned bits of onion from the bottom of the pan with the side of the spoon. Add the carrots, zucchini, squash, red pepper, tomatoes, kidney beans, macaroni, and red pepper flakes. Bring the pot to a boil. Boil until the vegetables and macaroni are soft, 10 to 15 minutes. Leeks hide a lot of dirt, so wash them thoroughly before using them. The best way to wash leeks is to slice them thinly and then put them in a bowl of water. Agitate the water and leeks, and allow the dirt to settle to the bottom of the bowl. Empty the water and repeat the process until no dirt settles at the bottom of the bowl. The recipe also calls for Yukon gold potatoes, which add a delicious buttery flavor to the soup. You can substitute with any other potato, such as white or russet if you wish. The recipe serves 6. In a large pot, heat the oil on medium-high until it shimmers. Add the leeks and cook, stirring occasionally, until they soften, about six minutes. Add the vegetable broth and potatoes and bring the soup to a boil. Reduce the heat to medium and cook until the potatoes are soft, about 15 minutes. Carefully pour the hot soup into the bowl of a blender or food processor, working in batches if necessary. Protect your hand with a folded towel. Place your hand on the top of the food processor or blender and pulse for 10 one-second pulses, allowing the steam to escape through the top hatch before continuing. Blend the soup until it is smooth. Stir in the chives and season to taste with sea salt and fresh cracked black pepper. Vegetable soup is the perfect dish to enjoy on a chilly day or when you're feeling under the weather, so don't skip it just because you have trouble finding plant-based broths. Make your own broth, and enjoy a steaming bowl full of the delicious, soothing results.